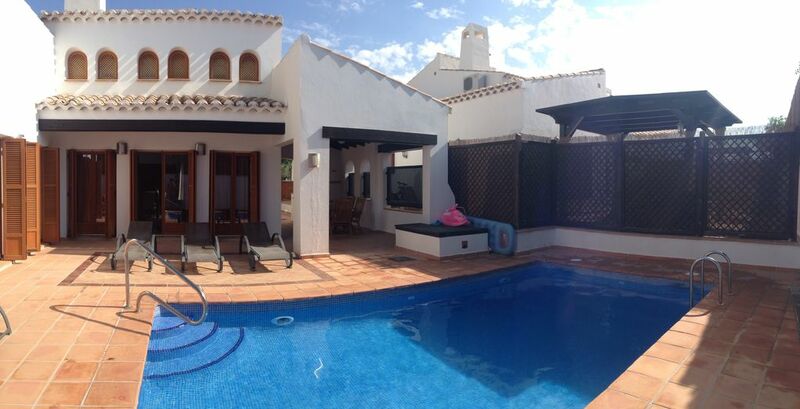 If you're having a golfing break or a family holiday our villa has everything for a great stay. To cool you down there's your very own pool, but If the sun gets too hot for you there's a covered outdoor area with furniture, sun loungers and a BBQ. The Clubhouse with shopping facilities is just a short walk away. A resort bus service which links with the other Polaris resorts is available with full supermarket available at La Torre golf resort (5min ride). The living room boasts high vaulted ceilings and is luxuriously furnished to an exquisite standard. For your safety the resort is gated and has 24hr security.All bedrooms and all villa fully air conditioned. With Free Wi-Fi , SKY TV & DVD in the villa. Golf: Arguably the finest desert links course in all of Europe, this superb 18 hole par 71 Jack Nicklaus designed golf course is fast becoming 'the' must play course in southern Spain and attracts golfers from all over the world who continue to give rave reviews. Situated in a beautiful natural desert valley, It is routed in a 'core' format that groups several holes together whilst keeping the surrounding development on the perimeter. This means many holes border other holes and not houses creating a more open and natural golfing experience. Rather than length, the course relies on subtle strategic elements to challenge golfers. This course puts a premium on accuracy, not power and favours the intelligent player who can manage his or her game. All the holes offer their own unique challenge and are a joy to play whether you decide to stroll the course or save your energy in a buggy. Rental Rate is Fully Inclusive which includes cleaning and linen Special Golf Rates are Available A £100 deposit is required to secure the booking and is payable with-in 7 days. So pleased you all enjoyed your holiday, It was a pleasure having you as guests. Have just returned from 2 week stay. 4. excellent oven and hob. 6. plenty of towels provided. 1. majority of kitchenware including crockery and cutlery were grubby and required going through the dishwasher. Frying pan so badly scratched that we couldn't use it as all the non stick surface had been badly scratched. Pyrex dish had sticky brown residue on it. Didn't expect to arrive and start cleaning. No cleaning equipment provided which we thought strange. 2. The air conditioning..owner failed to mention this is on a 2 hour timer. We spent 14 nights with broken sleep as every 2 hours a/c would run out and as there are no fans of any description and temperatures were in high 30's the villa became unbearably hot very quickly. 3. Wifi not great. Dips in and out all day. Fine first thing in morning but as day progresses, wifi cuts out. 6. Needs a proper ironing board. Theirs wobbles & you have to sit down to use. Impossible to stand and iron as it only raises to 3ft in height. 8. On arrival it took us 20 minutes to find the keys. Sellers instructions state keys are in box to left of property which is somewhat confusing. Keys are in a box under the outside BBQ. Seller needs to also provide clearer directions to the villa. Her directions took us to the entrance of El Valle but no directions to find villa from that point. Even the security guard had no idea how to find the road this villa was on. We all thought El Valle was far too remote for us. Literally in the middle of nowhere. A car is ESSENTIAL. Huge fly problem which reading previous reviews it must be an ongoing issue. Villas on this resort have been built far too close to each other to point you can hear any conversations neighbours are having if they are out by their pool area. Villa has new cutlery etc. All points noted and actioned. Changed to a new & more efficient cleaning company. New dishwasher installed. We have just returned from a wonderful weeks stay in this villa. It is even better and larger than it looks in the photos. Clean, spacious and finished to a high specification. We did not want to come home! We explored the area and found lovely beaches on La manga. Cartagena was a lovely day out with a boat trip to the castle. Iceland supermarket in San Javier was very useful to buy anything and everything English that you could get at home - particularly when travelling with very young children. We had a fantastic time and would definatley love to visit again soon. Thank you. Recommendations to owner - BBQ tools etc have not yet been replaced by the management company. Any possibilty of a couple of English speaking channels on the TV except Disney? The villa is lovely,clean and spacious. The pool is fantastic. There is a bbq, however no bbq tools!. Some other basics missing such as place mats, bottle opener,etc. The resort is VERY quiet. The club house is lovely and the supermarket sells everything you would need although best going to large outside supermarket if doing large shop. The Irish Clover bar was not open during our stay. Car reuired as the villa is not near any other restaurants. We found flies a great problem and after speaking to some fpeople who lived there they said there was a problem with flies- we were unable to eat outside in the evening due to this problem despite using oil burners, candles,bbq, etc. Other than that we had avery relaxing family holiday lounging by pool, reading and sight seeing. The BBQ tools, bottle opener & place mats have all been replaced by the maintenance company. Re flies the El Valle grass has been sprayed with chemicals by Polaris World so we will check that our garden was included. This house was fantastic and the golf was great. The resort is new so there is still a lot to be built on it and the facilities are fairly basic at the moment..just a bar and a restaurant and a supermarket. El Valle Golf Resort is located 20 mins from the wonderful city of Murcia. The old part of the city has many museums, churches, and plazas linked by quaint streets-ideal for exploring the numerous restaurants, tapas bars and shops. Murcia region boasts an array of sports for all tastes from watching Murcia football team in their wonderful new stadium playing in La Liga against the likes of Real Madrid and Barcelona. For the more active cycling, hiking and rock climbing are available in the mountains. If its a more relaxing time you're after, try the Mar Menor with its long sandy beaches and warm water where the bathing is safe. Water sports are available at a safe controlled distance away. The shopper is well catered for in Murcia with its 2 shopping malls with shops such as Zara, Hennes, Primark, C & A and Ikea. The historic city of Caragena is only 30 minutes drive away, where you can see many ancient relics and visit the colourful markets. Rental Rate is Fully Inclusive which includes clening and linen Special Golf Rates are Available A £100 deposit is required to secure the booking and is payable with-in 7 days.